Located near the Talbot University complex. Access to the free car park is from Slades Farm road, entrance at either end from Columbia Road, Ensbury Park. Slades Farm contains the Bournemouth Cycling Centre, the first outdoor banked velodrome built in the U.K, modelled on Manchester and Newport, with very similar 250 Metre dimensions. The area of the park that we use is around this entire facility. There are normal open park spaces combined with wooded areas, a community garden project and a fenced dog exercise area. Courses of 0.7, 1.0 and 1.4 km are available. Map packs (Approx. £1) are available from the Bournemouth Learning Centre next door where there are also toilets open in the day, and on summer weekends. This café is open at weekends from April to September and is open every day during the summer holidays. Maps can also be downloaded and printed, as described below. The park is open all the year, parking is free. 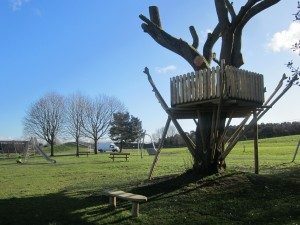 There is an excellent children’s play area near the car park, the park won a Green flag award for Bournemouth in 2013. The area is also a short walk through Talbot Woods next to the University adjacent to Wallisdown Road. The website for the Skatepark within the Slades Farm mapped area. Website of the Bournemouth Cycling Centre.